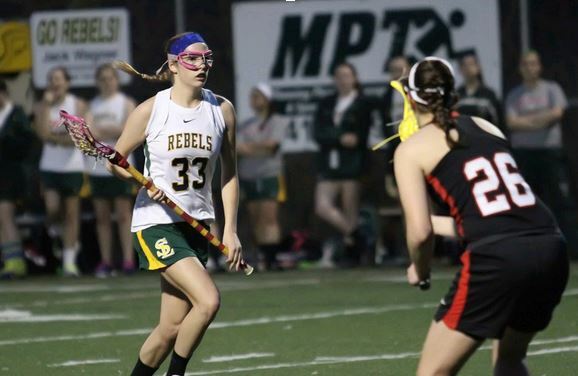 The Seton La-Salle Girls’ lacrosse team is looking to have another strong season. In the offseason Coach Brian Klisavage, affectionately known as Coach K, and his team have worked hard. They did speed training during the summer, and indoor work this winter at the Southpointe Field House. In addition to this training the girls participated in 7 v 7 tournaments , weight training and stick skill workouts after school. The many hours of hard work are looking to pay off in many ways this season. Coach K. said, “the seniors has set a goal of winning both their section and WPIALS.” The girls have chosen Seniors Tia Torchia and Mia Dandrea as their captains. This season will be different past seasons because of new rule changes to improve the game of girls lacrosse. The new rules include strict enforcement of rules governing illegal: body contact, obstruction of free space to goal, repetitive fouls, and stick contact and cross checking. The new rules changes will make the game very interesting to see how each school will adapt. The team’s biggest rivals for this season would be Mt.Lebanon, Oakland Catholic and Peters Township. All three teams are section rivals and Mt. Lebanon is the team’s section opener. Within the first week of April the girls will be playing all three of their rivals at home and Cupples Stadium in South Side. You can see the girls in action this Tuesday against Blackhawk High School at 6 for JV and 7:30 for Varsity at Merrick Field.